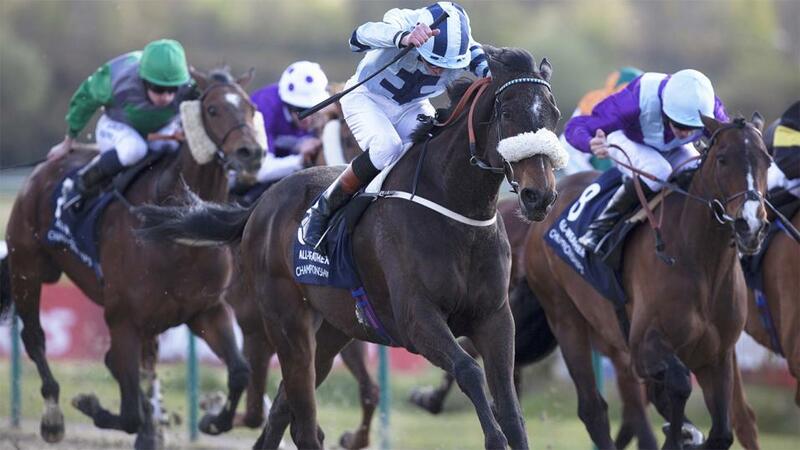 "...she deserves another chance to confirm the promise of her impressive debut, back down significantly in grade today..."
17:30 - COLONY QUEEN (1) probably hasn't finished improving yet, so she's taken to come out on top in this opening leg of the Placepot, with the longer trip likely to suit. Fanfaronade is in good hands and should do better at some point, while Lord Lamington and Tabou Beach Boy are others fancied to feature. 18:00 - CASHEL (3) was well backed to complete the hat-trick at Kempton last time, but he ultimately lost all chance at the start, rearing as the stalls opened (rider lost irons) and a long way detached by the time he was back on an even keel. It is probably best to put a line through that run under the circumstances, and he appears to have plenty in his favour as he attempts to get back to winning ways this evening, a narrow leader on weight-adjusted ratings and with Alistair Rawlinson - who guided him to his first career success earlier this year - taking over again in the saddle from a 7 lb claimer. 18:30 - ZOFELLE (2) looked potentially useful when making a winning debut at Doncaster last July, knowing her job and matching the way she moved smoothly into contention with a decisive finishing kick (won by four lengths). Admittedly, she then shaped as if amiss when well held on her only subsequent start in a listed event at Newbury in October, but Hugo Palmer has given her plenty of time to recover from whatever was ailing her on that occasion, and she deserves another chance to confirm the promise of her impressive debut, back down significantly in grade today. 19:00 - CHOSEN WORLD (8) is building up a good strike rate over C&D and can notch up win number four under Paul Mulrennan, who rarely fails to deliver when the money is down (34% strike rate on favourites). Irish Minister and Sureyoutoldme are a couple of the likely dangers. 19:30 - ALSVINDER (1) has been acquitting himself with credit in the main in some useful AW handicaps in recent months and he is fancied to capitalise on the drop in grade. Bengali Boys and Zylan can do battle for minor honours. 20:00 - HANATI (2) showed improved form to get off the mark at the second attempt at Wolverhampton in January, before running to a similar level when second on her most recent outing on the fibresand at Southwell. The bare form of that effort gives her a bit to find with Hanakotoba on weight-adjusted ratings here, but she has far more scope for improvement than that rival and looks to offer the better value of the pair at the current prices, representing the Simon Crisford yard that does well when sending only one runner to a meeting (£58.76 level stakes profit).